TVXQ, the forerunners of the ‘K-POP’ boom in Japan, have yet again proved just how popular they are. 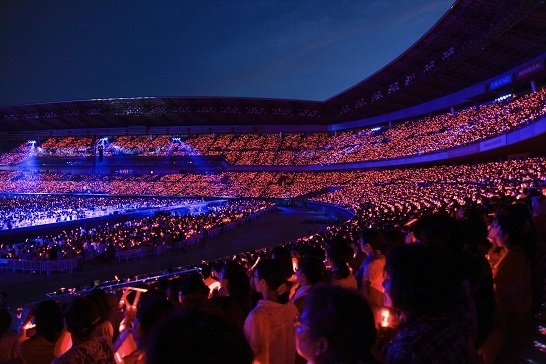 On the 17th and 18th of August, TVXQ held the finale of their ‘TVXQ LIVE TOUR 2013 ~TIME~’ Five Dome tour at the Nissan Stadium in Yokohama, Japan. Nissan Stadium seats 72,000 people, which means that TVXQ have attracted a total of 144,000 people across two days. The responses we received from Japanese fans on the 17th were varied. Though most of TVXQ’s fans were young women in the group’s earlier days, their fan base has expanded to both genders and all ages these days. TVXQ’s concert was held in Nissan Stadium, which has a seating capacity of 72,000 people, and the duo have attracted 144,000 people across two days. This is the biggest tour held and the biggest audience attracted by a Korean singer. Attracting a total of 850,000 people to their 18 concerts, TVXQ have proved yet again that they are still the frontrunners of the ‘K-POP’ boom with immense popularity to support them. Reblogged this on Changmin's Fridge. XD gomawo!it’s becoz its his wife and im a minfood shipper .kekekek.